Mixed Salad Annie: Berry Berry Cool Pie ~ Indeed! For a quick refreshing treat you have to try this pie!! I have been so busy lately, that I haven't had time to cook much, let alone bake a pie from scratch. So when I saw this recipe and knew I had all the ingredients on hand (which is another reason why I suppose so many people make these recipes), I figured what the heck. I did change a few things in the recipe. I already had a open can of sweetened condensed milk in the fridge. I used 1/3 cup in another recipe, so I used the remainder in this pie and believe me it was sweet enough so I'm glad that I used a lesser amount and I would do it again. Even my cool whip was partially used, so don't worry if you don't have a full container, it will still work with some missing! The lemon zest and almond extract were my additions and I think they added a homemade taste to the pie, so don't leave them out if you can help it. I hope you give this recipe a try and don't snub your nose at it like I would have done so many times. It really is, as Keebler says, "Berry Easy. Berry Cool. Berry Delicious!" 1. Mix together sweetened condensed milk, almond extract, lemon zest and lemon juice in large bowl until blended. Stir in berries. Fold in whipped topping. Spoon into crust. 2. Freeze (or Refrigerate) 5 hours or until set. If frozen, let stand 30 to 40 minutes before serving. Garnish with additional berries and mint leaves if desired. It looks great and perfect for this time of year. Oh wow! That looks great. Anything blueberry always catches my eye. 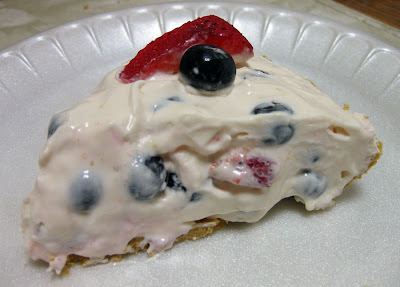 This looks like a great summer dessert, so colorful with all the berries too! A yummy pie! Perfect for the summer days! I love summer berries! So tasty! 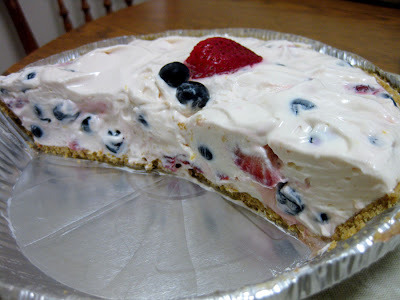 What a cool, creamy, yummy-looking pie! 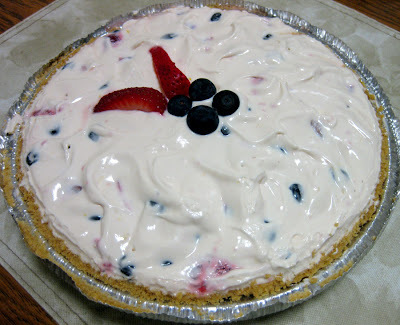 Nice pie...love condensed milk..so tasty...like the berries in it. Yummie yummie! Wow, that pie looks perfect for summer! I love no bake desserts. Oh I wish I had a slice of that pie tonight!! It looks delicious! And easy is bonus! Had this pie a few weeks back at a graduation celebration and every refreshing bite is simply indescribably delicious.